Open wide and get ready for one of the world’s greatest sandwiches. Talk about indulging the senses. With a deceptively simple smoked meat sandwich that could take on (and beat!) 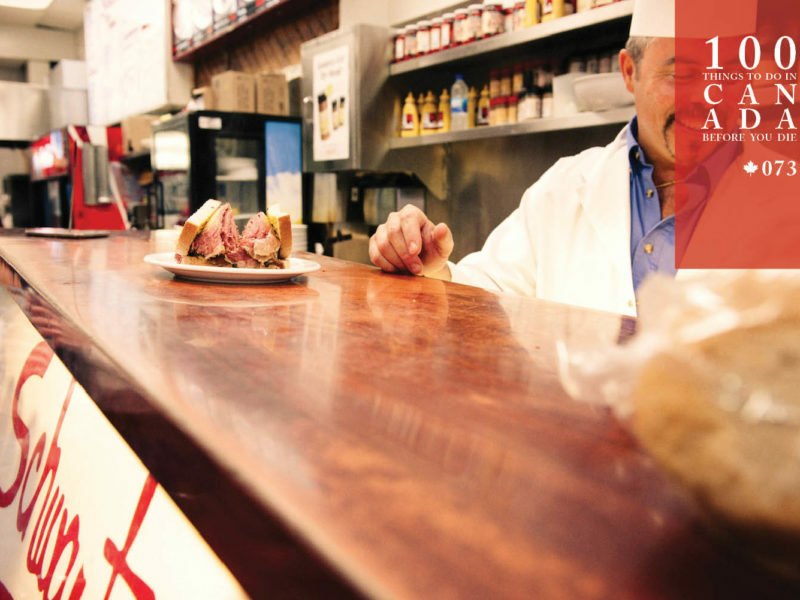 many of New York City’s finest delis, Schwartz’s in Montréal has been a local institution for nearly 90 years. The wonderful smoked meat sandwich. You’ll rarely approach without encountering a huge line of people craving the famed beef brisket that lies within, but for the true pilgrim patience is rewarded. Sitting shoulder to shoulder in the packed surrounds is an unforgettable way to tackle your smoked meat sandwich on rye with just the right amount of tangy yellow mustard, and, of course, a cherry coke to cut through the fat and work its magic on the saltiness of the main event. The facade of Schwartz’s in Montreal. Nothing this delicious is ever easy to come by so do your time and get in line. But if you are time-poor, here’s a tip: the lengthy lines are for the full dine-in experience. If you just want to be blown away by the sandwich, skip the queue and grab one from the take-out counter next door. It’ll still taste incredible on the street. Fill your belly at Schwartz’s Deli (schwartzsdeli.com) from 8 ’til late. Diners enjoy the sandwiches at Schwartz’s. 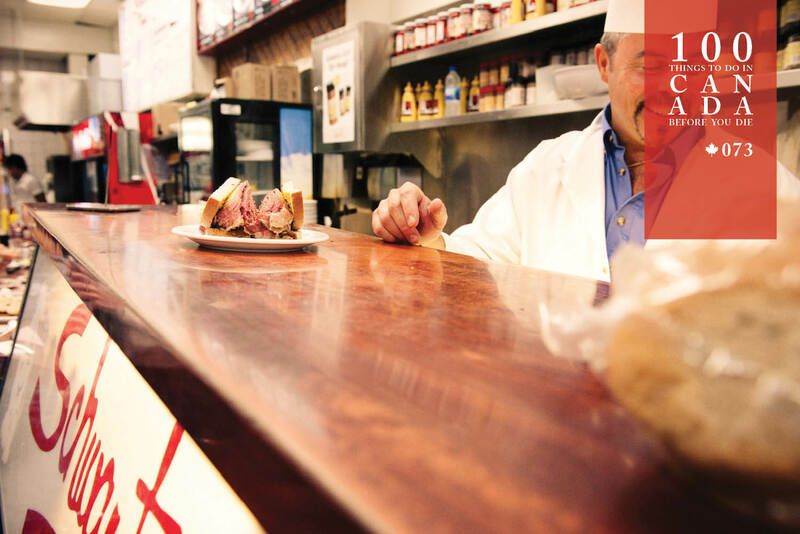 The oldest deli in Canada, Schwartz’s can be found at 3895 Saint-Laurent Boulevard, Montréal’s cultural and culinary artery known locally as “The Main”.